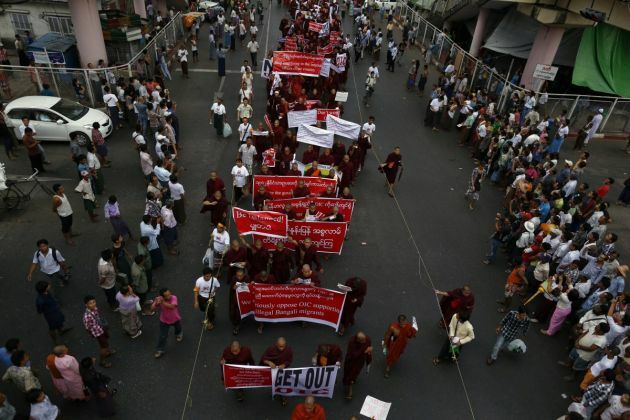 (Photo: REUTERS / Soe Zeya Tun)Buddhist monks and other people protest against a visit to Myanmar by a high-level delegation from the Organization of Islamic Cooperation (OIC), in Yangon November 15, 2013. The OIC secretary general and other members are in the country to assess the situation of Rohingya Muslims. The Archbishop of Yangon has called on Myanmar to grant citizenship for all those born in the country and an end to violence against the Rohingyas, a persecuted Muslim group in the Buddhist-majority country. In his New Year message carried by the Roman Catholic AsiaNews.it website for the World Day for Peace, Monsignor Charles Bo calls for unity "between the different souls" of "this wonderful nation." "Under Burmese law, the Rohingya is a de jure stateless community that has no right of citizenship. Its members cannot travel even within Myanmar without prior permission from State authorities," Muhammad Amir Rana, director at Pakistan Institute for Peace Studies (PIPS) wrote in Dawn.com in November. "Before the current wave of violence in Myanmar, the Rohingya issue was ethnic and legal in essence. Now it has gradually become a religious one too. Extremist Buddhist monks and small radical Muslim groups with external links are adding fuel to the fire," said Rana. In his New Year message Bo notes that over the past two years, Myanmar, or Burma as it is also known, "has opened its doors to the world," through a series of reforms in favour of democratic freedoms as well as some major economic, social and political reforms. "Today there is more space for civil society, the media and political actors," he says noting that a stable and lasting peace with ethnic minorities and the release of all political prisoners are key objectives to be achieved. Bo says optimistically that in Myanmar "for the first time in over 50 years," there are "concrete reasons for hope" for the future. The Myanmar Catholic leader said that democratic reform alone is not enough to halt decades of conflict, but the country needs an overall "peace process" and not a "simple ceasefire" with ethnic minorities. Among the religious conflicts that have brought "pain and suffering" to the Southeast Asian nation Bo cites violence against Rohingyas in the western state of Rakhine , which in 18 months has sown death and destruction. Since mid-2012, Buddhist-Muslim violence has erupted in different parts of the country, though mostly occurring in Arakan state. There, most of those left homeless and killed have been Muslims and of those, many are from the Rohingya minority. The Rohingya are regarded by the Myanmar's government as Bengali immigrants and are denied citizenship, as well as not being categorized as a separate ethnic minority. "Without fraternity, it is impossible to build a just society and a stable and lasting peace." In a multi ethnic and multi-confessional country Bo emphasizes the value of "unity in diversity" as fundamental along with the promotion of different histories, languages, traditions and cultures. Hence his invitation to the Burmese government and the international community to resolve the issues related to citizenship. "Every person born in Myanmar should be recognized as a citizen," says Bo noting that tragedies such as those of the Rohingya or conflicts in the north, in predominantly Christian Kachin state, are dramas that cause great harm to Myanmar. The Vatican had announced earlier in December that Isodore Ngei Ko Lat, a lay catechist killed by Burmese rebels in 1950, was on track to become Myanmar's first Catholic saint. Following that Bo said the announcement "means that the Holy Father is giving attention and care to the forgotten Church that was under military rule for 50 years." The year 2014 will mark 500 years since the first presence of Catholicism in Burma, and Archbishop Bo hopes that Pope Francis will visit Burma to mark the occasion. "We have sent the invitation to the Pope and we are hopeful that he will come," Bo told The Irrawaddy, a Southeast Asian newspaper. Pope John Paul II visited Thailand in 1984, and nine years later said mass to an estimated five million people in the Philippines, thought to be the biggest-ever papal audience. John Paul also went to East Timor in 1989, a visit that drew attention to Indonesia's occupation of the tiny half-island country that had once been a Portuguese colony. The Philippines and East Timor are the only two Catholic-majority countries in Asia, but there are substantial Catholic minorities in countries such as India, Vietnam and Korea. Myanmar has around 770,000 Catholics spread across 16 dioceses, Bo told The Irrawaddy, accounting for about one fifth of Burma's total Christian population, which Bo estimates at about 7 percent of the county's 50-60 million people. Inter-religious interaction is key part of Bo's work and he is involved in constant dialogue with Myanmar's majority Buddhists and minority Christians, Muslims, Hindus and others. "There are Rohingyas who came in more than a century ago," said Bo in his interview with The Irrawaddy, noting that those who could show they had at least a century lineage inside Burma should be given citizenship.